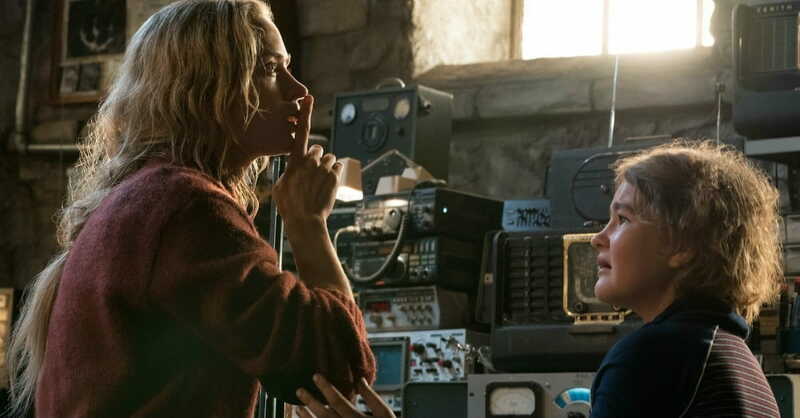 Editor’s note: This story about A Quiet Place contains spoilers. Imagine being part of a college screenwriting class where the assignment involves writing a movie about a child-less and baby-less world – that is, a society where pregnancies are terminated, no questions asked. The professor then adds one stipulation: It must be a thriller. It’s a difficult task that eludes you for several days, until you wake up one morning with an idea. Your movie will tell the story of eye-less monsters who have ultra-sensitive ears. Instead of attacking and killing creatures they see, these blind monsters attack and kill anything they hear. Thus, anyone who wants to survive must live a radically quiet life. This means no more creaks in the floor and no more slamming of doors, but it also means no more children on the playground or kids in the yard. And, finally, it means no more babies, who cry when they’re hungry, when they’re tired, and when they just want to be held. What sane person would bring a baby into the world when it means certain death? Of course, you don’t have to wait years for this plot to make it to the big screen, although the version in theaters has a dramatically different twist. It’s the storyline of the hit movie A Quiet Place (PG-13), which tells about a very sane couple, Lee and Evelyn Abbott (played by John Krasinski and Emily Blunt), who spit in the face of modern logic and pro-choice sense by getting pregnant and then bringing a baby into this deadly, monster-filled world. The movie surprised Hollywood by finishing No. 1 on opening weekend with an impressive $50 million gross and landed in the top three its first five weekends. Perhaps A Quiet Place wasn’t intended to promote a pro-life message. Most likely, a pregnancy and a baby were inserted into the story simply to add tension and drama. It worked. Still, it’s difficult to watch A Quiet Place and not see life-affirming messages. Here are three. 1. Life is worth protecting. No matter the age. Lee and Evelyn will do anything to defend their three children, from their teen daughter Regan to their youngest son, Beau. But when an accident happens and a monster kills Beau, they find themselves second-guessing their choices: Why weren’t they there to protect him? Why could they have done differently? Underlying their questions is a core fact of Scripture: Life is worth defending. Perhaps they were emotionally broken, trying to replace Beau. Or maybe they were valiant in the fact of danger, refusing to halt their family goals. Or perhaps they figured that without the priceless joys of this world, life wasn’t worth living. Whatever their reason, Lee and Evelyn were affirming what the author wrote in Psalm 127:3: Children are a gift from the Lord. When conventional wisdom screamed “abort,” they said no. We even see the mom use a stethoscope to check on the unborn baby’s heartbeat. Post-birth, the mom does everything in her power to protect the baby, clutching it to her chest as the creature gets menacingly close. And don’t forget one of the movie’s final scenes, in which the father makes the ultimate sacrifice for his oldest children. 2. Life is worth the sacrifice. Bringing a baby into a normal, noise-filled world is difficult enough. But bringing a baby into a word full of deadly monsters that kill anything that makes a sound? That’s nearly impossible. Unless, of course, you’re willing to put forward the work needed to protect an innocent baby. Unless you’re willing to sacrifice. So, Lee and Evelyn built a sound-proof basement. They designed a tech-savvy, sound-proof crib, complete with an oxygen mask and a lid. They even set up an outdoor system with red lights – which were to be turned on if Evelyn went into labor while Lee was not in the house. Contrast this with our society’s throwaway mentality, which views inconvenience as a morally and legally justifiable reason to have an abortion. In one excruciating sequence, we even see the mom accidentally step on a nail, lift her bloody bare foot from the floor, and then (somehow) remain quiet so she can go forward with the delivery. It would have been the perfect moment to scream: It’s not worth it! But she didn’t. 3. Life is worth celebrating. There is no baby shower in A Quiet Place. There are no balloons, cake or presents, and definitely no party horns and plastic kazoos. But that’s OK. The joy in the eyes of Lee and Evelyn is enough. During one poignant scene, they even manage a smile. It’s as if they’re saying: We did it! A Quiet Placeisn’t an explicitly pro-life movie in the mold of Bella or October Baby. Heck, it’s not even an intentionally pro-life film. But like Horton Hears A Who, the life-affirming message of A Quiet Place can be heard within the plot, from beginning to end. That is, if we’re listening. Michael Foust is the husband of an amazing wife named Julie and the father of four small children. Visit his blog, MichaelFoust.com.